I wasn’t looking for a new boat at the Beale Park Boat show in 2008. But I couldn’t help noticing how smoothly that cream-sailed yawl was moving around the lake. Seemingly effortlessly. Of course, I wasn’t looking for a new boat, but we went for a sail in it anyway and met Matt Newland, the designer. I knew I was safe because, as I told him, if I was looking for a new boat, I would want one with a cabin, which this Bayraider didn’t have. I remember his eyes gleaming slyly as he told me that actually he did have a cabin version on the drawing board, and he was just waiting for the first order to put it into production. I realised I was hooked, and probably landed, but took the precaution of visiting the boatyard in Cardigan before I did anything rash. I liked what I saw and I liked the people I met so I took the plunge and placed the order for what would be Baycruiser number 1. Somewhat embarrassingly, my deposit cheque bounced, but it all got sorted in the end and in July 2009 (“It’ll be ready in April…”) I picked her up from Cardigan and have been delighted with her ever since. The Baycruiser 20 suits my criteria. 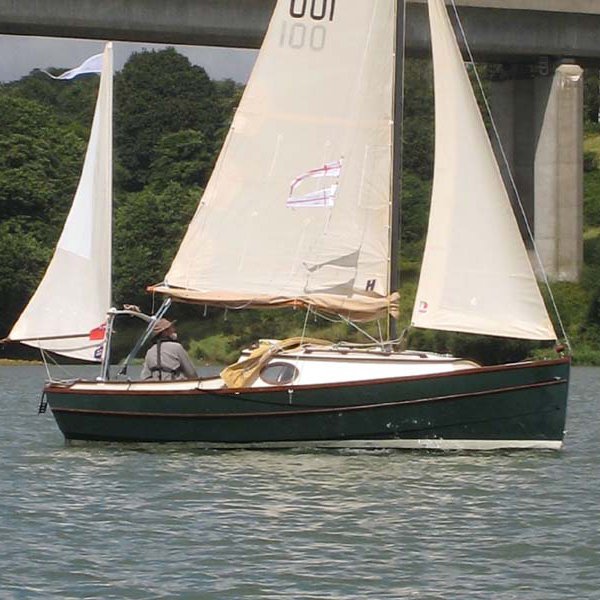 She is light enough to trail with an unbraked trailer but is ballasted on the water, so she is very stable. She floats to a mooring in Poole Harbour all summer and comes home for the winter. I can sail her easily on my own, but she can take up to four, at a squeeze. She has a remarkably big cabin, which I use as my home from home. I have six paintings and a small library in her (so much for lightness). I keep the lockers stuffed with enough food so that if I suddenly have a chance to go down to her, I always have enough on board for a weekend afloat. It is hard to say what the most memorable moments with her have been, but arriving in the Solent from Poole for the 2011 English Raid, to be asked “have you just sailed from Poole? It’s blowing force 7 out there!” was good. I hadn’t really noticed. But the most satisfying moments have been when I have backed the trailer down a slipway, just getting the tyres in the water. There is always someone there who says “Surely you don’t think you can launch into that depth of water?” Touch wood, I have done so every time so far. It produces despairing looks of envy from people who are wading out up to their waists, wondering how they are going to get their trailers back to land. Daisy Grace had some inevitable problems as a brand new design. Her first trailer broke when I tried to recover her. Matt came down from Cardigan to Poole with a new one. Her original rudder blade swelled and jammed in the rudder head. Matt designed and made a new one, which never jammed and works far better. When I lost my mainsail and boom (don’t ask) Swallowboats (and my insurers, Bluefin, to give them well deserved credit) pulled out all the stops to make a new boom and get a new sail for me as quickly as possible at the height of the building season. I would recommend Swallowboats to anyone. Their designs are fascinating and they work. Their after sales service and support is excellent, friendly and personal. I will now stick with my Daisy Grace. I’m not looking for a new boat. No, really I’m not. Honestly, I’m not looking….